TOKYO - The head of the International Monetary Fund on Thursday called for urgent action to tackle Europe's debt problems and an approaching fiscal crisis in the U.S., warning that the struggling world economy is already falling short of even pessimistic expectations. IMF chief Christine Lagarde, speaking to reporters as the IMF and World Bank held annual meetings in Tokyo, praised recent steps taken by the European Central Bank and European governments, but said "more needs to happen, and faster." Finance ministers and central bankers from the Group of Seven richest nations met for about 90 minutes on the sidelines to discuss the European debt crisis. They also discussed the impending budget impasse in the U.S., an issue that prompted some at the meeting to express concern, according to a senior Japanese Ministry of Finance official who briefed reporters on condition of anonymity, which is ministry policy. They released no communique. U.S. Treasury Secretary Timothy Geithner was upbeat about recent moves in Europe to stabilize and reform crisis-stricken economies. "The basic thrust of the strategy is right and good," he told a conference on the sidelines of the IMF and World Bank meetings. "They're already having traction in improving competitiveness." Geithner also sought to strike a reassuring tone regarding the threat of the so-called "fiscal cliff" of tax increases and deep spending cuts that will take effect in 2013 unless Congress and the Obama administration resolve a budget impasse. The Obama administration intends to try to fix the problem before the end of the year, Geithner said. "We're going to take a run at it." The IMF has urged the U.S. to raise the ceiling on the level of debt the government can issue, which is capped by law. In August 2011, a battle between Republicans and Democrats over raising the limit wasn't resolved until the U.S. almost defaulted on its debt. Lagarde called for "decisive action" on the issue. She also said Greece should get two more years to meet austerity targets as agreed upon with its creditors. After nearly defaulting on its mountain of debt, Greece has survived on international bailouts since May 2010. But to secure and continue receiving the loans, Athens imposed tough austerity measures, such as spending cuts and tax increases, in an attempt to get its public finances in order. "It's sometimes better to have a little more time. This is what we have advocated for Portugal, this is what we advocated for Spain, and this is what we are advocating for Greece," she said. "What I have said repeatedly about an additional two years was necessary for the country to actually face the fiscal consolidation program that is considered." "We are not expecting a very, very strong recovery. 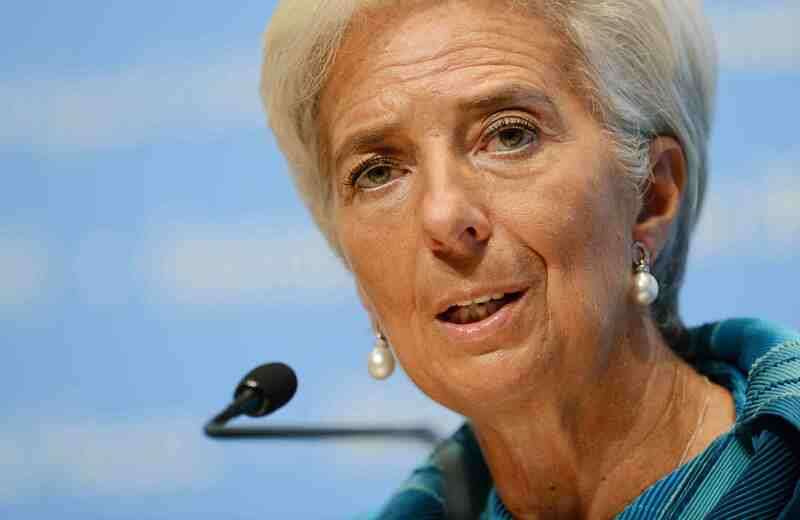 The recovery continues, but it continues more slowly than we had expected earlier this year," said Lagarde. The slowdown is "having a ripple effect on emerging markets, and in particular in Asia." She did praise recent steps to shore up Europe's financial system, which has been burdened by high government debt and weak banks in countries such as Greece and Spain, but stressed that more needs to be done. The ECB has decided to buy unlimited amounts of government bonds to help lower borrowing costs but countries that want to benefit from that measure need to apply to other euro nations for a bailout first. European governments have also taken steps to reduce budget deficits. A proposal to design a European banking supervision system, however, has run into obstacles, with Germany wanting more time to finalize details before making the ECB the supervisor of banks. Greece, Ireland and Portugal have already received bailouts from the IMF, European Central Bank and European Union. Spain has worried investors by declining so far to ask for financial aid from the 17 country grouping that uses the euro currency. "Action has already occurred," Lagarde said. "But more needs to happen and faster." Speaking just weeks before the U.S. presidential election, Geithner emphasized the progress made in countering the global financial crisis and reviving growth. "From my perspective, the U.S. economy is doing significantly better than we had any reason to expect," he said. Lagarde also said two senior Chinese finance officials who cancelled their trip to Tokyo amid a territorial dispute with host Japan will "lose out" by not attending. "Our concern is that they will be missing a great meeting," she said. "We have a lot of substantive issues to discuss." Diplomatic tensions have flared between the two Asian giants over a cluster of tiny islands in the East China Sea controlled by Japan but also claimed by China. In an apparent sign of Beijing's anger over the issue, People's Bank of China Gov. Zhou Xiaochuan, who was scheduled to give the event's closing speech on Sunday, will not be attending. His deputy will represent him in the meeting and deliver the speech. Speaking in Beijing, China's foreign minister, Yang Jiechi, described the decision to have Zhou and some other senior finance officials to stay home as "completely appropriate." But much is at stake. Lagarde stressed that economies in Asia are critical to global growth, and hoped that disputes between countries in the region can be resolved for the good of economic cooperation in Asia and the rest of the world. "We hope that differences, however longstanding, can be resolved harmoniously and expeditiously so that from an economic point of view cooperation can continue ... since we are all very closely interconnected," she said. Japanese auto sales in China plunged last month, and tens of thousands of Chinese tourists have cancelled trips to Japan, which is depending on China as a source of growth amid the global slowdown. The dispute is also an economic negative for China. Before tensions escalated, China's economy was already slowing and grew at its slowest rate in three years in the second quarter.